Does your child or teen want to build strength and stamina? Pediatricians and youth fitness trainers say it is safe and beneficial introduce young people to supervised, progressive weight training. Resistance exercise used in strength training builds muscle strength and stamina. This increases lean body mass and improves the metabolic rate, which is especially beneficial for kids who are overweight. Strength training on a regular basis is good for heart health, cholesterol levels, and building strong bones. Strength training is also a part of programs to reduce knee injuries for girls. It can help improve sports performance, but even more importantly it builds a fitness habit that can serve the child well throughout life. The American College of Sports Medicine (ACSM), the American Academy of Pediatrics (AAP), and the National Strength and Conditioning Association (NSCA) support children's participation in appropriately designed and competently supervised strength training programs. At What Age to Start Weight Training? Weight training is appropriate once a child can maintain balance and postural control and can listen to and follow directions. This is usually around age 7 or 8 but it depends on your child's maturity level. Although children under 10 years may develop strength from training with weights, adolescents in the range of 10-15 years are usually the group who are the most interested. Your child should also want to do this activity and be prepared to train multiple times per week. Strength training for children is not weightlifting, powerlifting, or bodybuilding in their purest forms, which are aimed at competition. These distinctions should be clear to parents, trainers, and children. 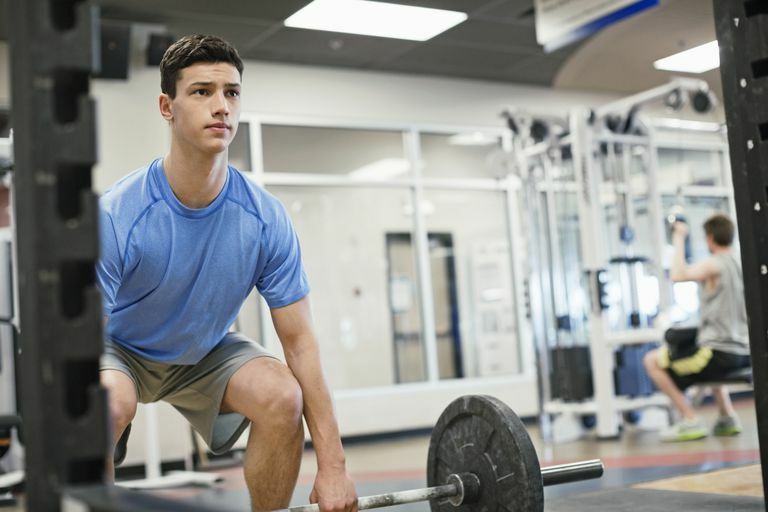 Before a young teen starts a formal weight training program, an evaluation by a pediatrician or sports medicine doctor is recommended. There are a few conditions where weight training is not recommended, including for children with uncontrolled high blood pressure, seizure disorders, or those who have undergone chemotherapy for childhood cancers. A qualified trainer with some experience in training teens should supervise participants at all times, especially for groups that are likely to lose concentration. A suggested instructor-to-child ratio should be 1 to 10 (or fewer). It might be best to start with one-on-one sessions with a personal trainer or coach. Good form and progression of loads over time are essential for any novice weight trainer, but especially with developing and immature bodies. Always be aware of safety requirements including proper technique and appropriate weight selection. Competition between friends or other children in the training group can lead to the selection of a weight that is too heavy or using poor technique that could lead to injury. When choosing a place to work out, look for a well-equipped gym with equipment that is adjustable for the light loads required for less-robust adolescents. If a gym isn't an option, light dumbbells or bodyweight exercises can be substituted for machine equipment and barbells. Given that good form and lifting technique are essential, exercise type, weight selection, repetitions, and sets are the main variables to choose from. Here is an example walk-through using a dumbbell curl as an exercise example. Ensure sufficient food and fluid is taken prior to the exercise session, preferably with carbohydrate content. Do a warmup first. This could include a jog, running on the spot, mild stretches, and some simulation of the exercise with very light weights or just body weight. Demonstrate the correct form and technique. For example, for a dumbbell curl the weight should be light enough so that other body parts are not bought into the movement in order to lift the weight. Jerking the head and torso backward with the lift is a sign the weight is too heavy. Even if this occurs at the top of the repetition range—number 12 for example—the weight is probably too heavy. Choose a weight that allows at least 12 repetitions and preferably 15. This ensures the weight is light enough not to place too much stress on joints and the developing cartilage and bone, which is one of the potential risk areas for weight training for children. Two sets for each exercise is probably enough for younger children, and it should minimize boredom as well. Aim for six to 10 exercises depending on age, fitness, and maturity. Exercise number and weights can be increased gradually as children get older or stronger. Supervise as much as possible. Parents should take some responsibility for learning a few weight training basics so that they know what’s appropriate. Cool down with stretches and mild calisthenics. Two sessions each week is sufficient—three at the most. Children and adolescents should have at least one day in between sessions to ensure recovery from muscle soreness. Make the workout fun, perhaps with music. Boredom comes quickly to younger children and can produce careless behavior. Below is a typical gym weight training workout suitable for adolescents in the 12- to 15-year-old age group, and for both girls and boys. Warmup: The warmup should be 10 to 15 minutes in length to get the blood circulating into the muscles, preparing them for the strain they will be under during the workout. Warm up with aerobics for 10 to 15 minutes, followed by a few form lifts with no weight load before each loaded exercise. This will help the body and mind to become acquainted with the proper form of each exercise, which is critical for safety and effectiveness. Exercises: All exercises are performed in 2 sets and 10 repetitions. Cooldown: A good cooldown with light stretching, 5 to 10 minutes is also recommended. Schedule: Train two to three times per week. The workout should last 20 to 30 minutes. Progression: It's best at any age to increase the weights by no more than 10 percent per week. Coach your child to use this gradual progression. This would probably translate to a 2- to 5-pound increase in weight per week. Progression can also be done by increasing the number of sets or exercises per set. Strength Training. American Academy of Pediatrics.